Successfully Added 2 DIN In Dash Car Stereo - 7 Inch Touch Screen, 64GB Micro SD Slot, FM Radio, Bluetooth, Hands Free to your Shopping Cart. Support up to 180 Watts of audio though 4 speakers this universal in dash car stereo will bring your car to life and provide great entertainment on any journey making driving a real pleasure. Often referred to as MP5 players this 2 DIN car stereo has DNP, 'Download and Play' functionality, meaning you can pull in all your films and audio files without the need for any reconversion and enjoy support of all major formats. This 7 Inch car stereo brings great support as it plays all the files your standard MP4 player can support but doesn't need to mess about converting any to the AVI format first. 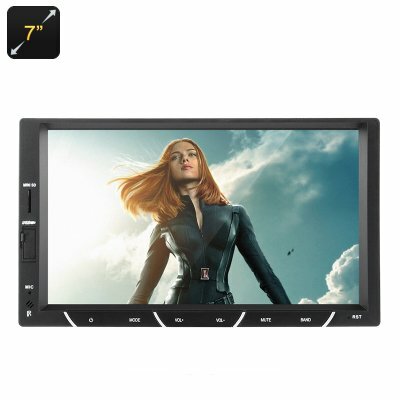 The 7 inch touch screen display brings a large viewing area for movies and has an easy to navigate menu for accessing all the video and music options, such as sound equalization. With Bluetooth support you can pair your Smartphone for hands free call management allowing you to safely answer and make calls on the go. This also provides an easy way to stream music, view photos or watch videos that are stored or your phone. FM Radio support for Europe and America will let you preset up to 30 stations but if you would rather select your own play lists then you can take advantage of the micro SD card support. This will allow you to add up to 64GB of media, that equates to over a month of continuous music giving you plenty to choose from. Having connection ports for a rear parking camera will let you hook up this in dash car stereo to your car's reverse camera for hassle free parking, making it easy to reverse into those tight spots. This 2 DIN Car Stereo comes with a 12 months warranty, brought to you by the leader in electronic devices as well as wholesale Car Stereos and DVD players..
To ensure your safety, the driver shall not watch video or operate the player while driving for it may distract the driver from driving.